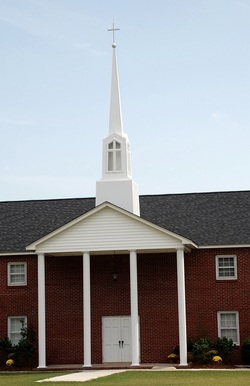 "Preparing people to meet god"
Welcome to Forest Hills Independent Baptist Church. You, your family and friends are invited to join us every Sunday and Wednesday as we gather together to worship and give praise to our Lord and Saviour Jesus Christ. We are a close family of believers who are ready to welcome you with open arms and friendly smiles. Lead by our Pastor Bro. James E. Murray our congregation offers something for every age group. From nursery to Seniors there is something for all. The Lord has blessed in that we have the opportunity to construct a larger more up-to-date Sanctuary. This is how it looks as of early August. We don't dare use the word "modern" to describe our building efforts. Unlike some churches FHBC is still an old fashioned Bible believing, Bible preaching church. While our building may be new, our beliefs are set in old fashioned Biblical principles. We are adding a few new "gadgets" to make our worship service better, but the way we worship will never change. We are eagerly anticipating having our first service in our new Sanctuary, and hope that you make plans to join us in worshiping the Lord. We are located on Forest Hills Drive, just off W. Bobo Newsome Hwy (151 by-pass) in Hartsville, SC (Behind the old CVS Pharmacy).